We previously reported that activation of the phosphatidylinositol (PI) 3-kinase pathway was important in M-CSF-induced monocyte survival. Because M-CSF also induces activation of the mitogen-activated protein (MAP) kinase extracellular-regulated kinase (Erk), we focused on dissecting the mechanism used by M-CSF to induce Erk activation in human monocytes. We found that, in addition to the MAP/Erk kinase inhibitor PD098059, the PI 3-kinase inhibitors LY294002 and wortmannin both suppressed Erk activation in M-CSF-treated monocytes, suggesting that 3-phosphorylated products of PI 3-kinase played a role in Erk activation. Investigating the biochemical pathways regulated by PI 3-kinase to activate Erk, we found that, in response to M-CSF, normal human monocytes induced reactive oxygen species (ROS), which were suppressed by the PI 3-kinase inhibitor wortmannin but not by the solvent control DMSO or the MAP/Erk kinase inhibitor PD098059. We next found that, in the absence of M-CSF, ROS could induce Erk activation in human monocytes. Exogenous H2O2 induced Erk activation in human monocytes, which was suppressed by exogenous catalase. To determine whether ROS induced by M-CSF played a role in Erk activation, we found that N-acetylcysteine and diphenyleneiodonium both suppressed Erk activation in M-CSF-treated monocytes. Erk activation by M-CSF also seemed to play a role in cellular survival in monocytes. These data suggest that, in M-CSF-stimulated human monocytes, PI 3-kinase products and ROS production play a role in Erk activation and monocyte survival. Human monocytes are short-lived cells and, in the absence of serum, are dependent on survival factors like M-CSF for production, survival, and differentiation (1, 2). Mice deficient in M-CSF have reduced numbers of circulating monocytes and tissue macrophages, and this reduction is reversed by the addition of exogenous M-CSF (3, 4, 5). These findings demonstrate that M-CSF plays an important role in monocyte/macrophage homeostasis and survival. We previously showed that phosphatidylinositol (PI)4 3-kinase inhibitors blocked M-CSF-induced monocyte survival (6). To induce cellular survival, we found that M-CSF stimulated the activation of Akt, which was suppressed by PI 3-kinase inhibitors. In addition to activating Akt in human monocytes, M-CSF also stimulates the phosphorylation and activation of the extracellular-regulated kinase (Erk). It is understood that Erk activation is induced by M-CSF through phosphorylation of specific tyrosine residues in the M-CSF receptor, promoting the translocation of adapter proteins like Grb2 and Shc to the receptor. Grb2 binds the guanine exchange factor for Ras, son of sevenless, which catalyzes the conversion of inactive Ras-GDP to active Ras-GTP. Ras-GTP induces the activation of Raf1, which activates mitogen-activated protein (MAP)/Erk kinase (MEK; also known as MAP kinase kinase). Activated MEK induces Erk activation (7). Inhibitors like PD098059, which suppress MEK activation, reduce Erk activation in response to M-CSF (7). In addition to activation of this classic MAP kinase pathway, PI 3-kinase products are capable of inducing Erk and DNA mitogenesis (8), as well as other signaling pathways. These affected pathways include those in T and B cell Ag receptors, receptors for the Fc portion of IgG, and growth factor receptors, such as platelet-derived growth factor as well as M-CSF (9). The activity of PI 3-kinase results in the accumulation of PI 3,4,5-trisphosphate and PI 3,4-bisphosphate in the cell membrane (10, 11, 12, 13). In turn, these 3-phosphorylated PI products can serve as targets for proteins containing pleckstrin homology domains (11), including Vav, the GTP exchange factor for the NADPH oxidase protein Rac (14). By stabilizing the NADPH oxidase complex, activated Rac promotes the production of reactive oxygen species (ROS) (15). In fibroblasts transformed with constitutively activated Ras, PI 3-kinase products induce Erk activation through its effects on the small GTP binding protein, Rac1 (8). Activated Ras can directly activate the PI 3-kinase enzyme complex, creating a bridge between the MAP kinase and PI 3-kinase pathways (16). Thus, the goal of this study was to establish the biochemical pathways regulating Erk activation in primary human monocytes and to determine whether PI 3-kinase and ROS were involved in this M-CSF-activated pathway. Erk plays an important role in cellular homeostasis, including its significance in activating cellular survival pathways. Erk has been directly linked to the activation of NF-κB, which plays an important role in cellular survival in a number of cell types. In addition its significant role in cellular survival, Ras and Erk activation has been linked to DNA turnover and cellular transformation. Thus, understanding the role of Erk in monocyte survival in M-CSF-treated cells will lead to important insights into the regulation of inflammation. We found that inhibitors of PI 3-kinase activity, LY294002 and wortmannin, suppressed Erk activation in M-CSF-stimulated monocytes, suggesting that PI 3-kinase products were involved in Erk activation. To further explore the mechanism by which PI 3-kinase products activate Erk, we found that M-CSF induced the production of ROS in human monocytes that were blocked by the PI 3-kinase inhibitor wortmannin. We hypothesized that ROS may be capable of inducing Erk in human monocytes. In support of this hypothesis, we found that, in the absence of M-CSF, exogenous H2O2 induced Erk activation. Erk activation by H2O2 was inhibited by catalase. Moreover, we found that N-acetylcysteine (NAC) (9) and diphenyleneiodonium (DPI) (10) suppressed Erk activation in M-CSF-stimulated monocytes. These data suggested that M-CSF induced Erk activation, at least in part, through activation of PI 3-kinase and ROS in human monocytes. Recombinant human M-CSF was purchased from R&D Systems (Minneapolis, MN). LY294002, wortmannin, PD098059, SB202190, SB203580, and SB202474 were obtained from Calbiochem (La Jolla, CA). Protein G-agarose was purchased from Invitrogen Life Technologies (Carlsbad, CA). RPMI 1640 medium was obtained from BioWhittaker (Walkersville, MD). FBS was obtained from HyClone Laboratories (Logan, UT). Anti-Akt and anti-phosphotyrosine (clone PY20) Abs were obtained from Santa Cruz Biotechnology (Santa Cruz, CA). Anti-phosphotyrosine clone PY72 was a kind gift from Dr. B. Sexton, (Salk Institute, La Jolla, CA) and anti-phosphotyrosine clone 4G10 Abs were purchased from Upstate Biotechnology (Lake Placid, NY). Anti-Erk2 Abs were from Santa Cruz Biotechnology. Anti-phospho-Erk1/2 (Thr202/Tyr204) were purchased from Cell Signaling (Beverly, MA). All other reagents were from Sigma-Aldrich (St. Louis, MO), unless otherwise specified. Monocytes (66 ± 2.1% CD14+) were isolated from the heparinized blood of normal volunteers as previously described. Cells were subsequently incubated in RPMI plus 10% FBS plus 20 ng/ml recombinant human M-CSF for 18 h at 37°C in sterile polypropylene tubes. Monocytes were serum starved in RPMI alone for 2–3 h at 37°C before being subjected to restimulation with M-CSF or H2O2 for 3 min. Human monocytes in 1 ml of RPMI were stimulated with 100 ng/ml M-CSF as outlined in the figures. At the indicated times, RPMI was removed and replaced with 1 ml of ice-cold lysis buffer (50 mM Tris-HCl (pH 7.2), 150 mM NaCl, 10 mM NaF, 0.5% deoxycholate, 10 mM EDTA, 0.1% SDS, 1% Nonidet P-40). Samples were then incubated at 4°C for 20 min, transferred to tubes, and centrifuged to remove the insoluble fraction. Samples were then subjected to immunoprecipitation, as shown in the figures, for 12 h at 4°C. Immunoprecipitates were recovered by the addition of protein G-agarose for 1 h at 4°C. Laemmli sample buffer containing 2-ME was then added to the samples, and they were incubated at 95°C for 5 min. Samples were resolved by 10% SDS-PAGE, transferred to nitrocellulose, and probed with primary Abs as indicated. When necessary, nitrocellulose membranes were stripped of primary Ab with 2% SDS-0.1 M 2-ME, 62.5 mM Tris (pH 6.8) at 55°C for 30 min, washed, and reprobed. Monocytes (5 × 106/condition) were isolated and incubated with specific inhibitors or solvent control (as indicated) for 30 min. The cells were then incubated in the presence of 100 mM 5,5-dimethyl-1-pyrroline-N-oxide (DMPO) with M-CSF (100 ng/ml) in a magnetic field as described (17). The EPR spectra were taken over the indicated time points on a Varian E-9 X-band EPR spectrometer (Varian, Palo Alto, CA) in a quartz flat cell. The following were typical instrument settings: 20 mW, microwave power; 100 kHz, modulation frequency; 0.8 G, modulation amplitude; 2 min, sweep time; and 100 msec, time constant. Monocytes (5 × 106/condition) were isolated and incubated in dihydrofluorescein (HFLUOR; 5 and 10 μM) for 30 min at 37°C. Using fluorometry, measurement of ROS production was performed at baseline and after stimulation with M-CSF (100 ng/ml) (18). Apoptotic DNA fragments were purified using DNA isolation kits (Suicide-Track DNA Isolation kit; Oncogene Research Products, Cambridge, MA). DNA fragments were resolved by 1.6% agarose gel electrophoresis. DNA bands were visualized by staining with Syber-Green purchased from Molecular Probes (Eugene, OR). The DNA fragments were analyzed on a digital gel documentation system (Gel-Doc 1000; Bio-Rad, Hercules, CA). The goal of this study was to define how Erk activation was regulated in M-CSF-stimulated monocytes. We found that, in addition to the MEK inhibitor PD098059, the PI 3-kinase inhibitor LY294002 suppressed Erk activation in M-CSF-stimulated human monocytes, as measured with Abs against active phosphorylated-Erk (Fig. 1⇓A) and quantified by densitometry (Fig. 1⇓B). The membranes were stripped and reprobed with anti-Erk Abs (Fig. 1⇓C). 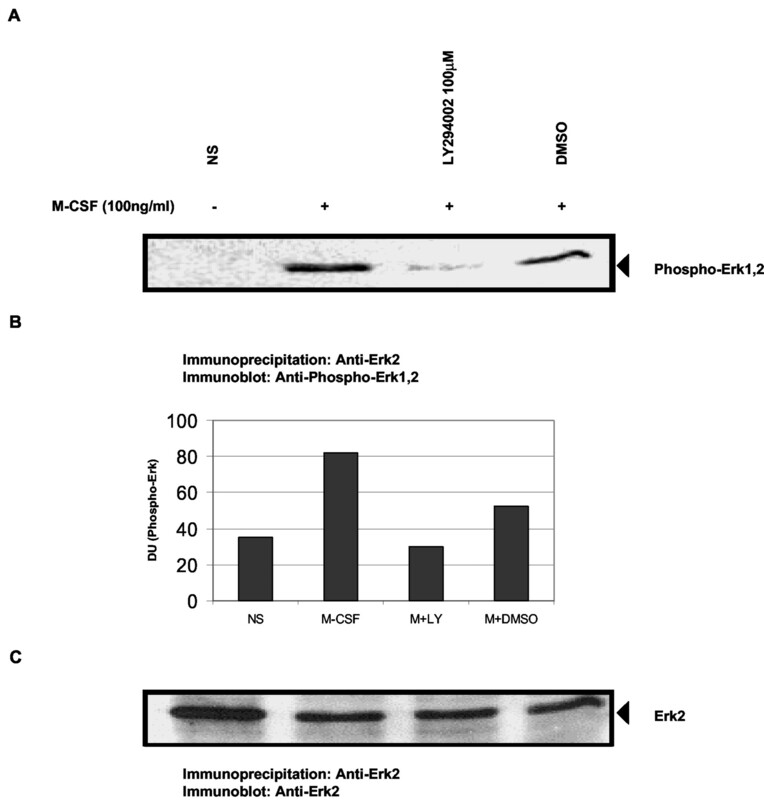 PI 3-kinase inhibitors suppress Erk activation induced by M-CSF in human monocytes. Human monocytes (10 × 106/condition) were serum starved, preincubated with LY294002 (100 μM) or the solvent control DMSO for 30 min, and either left not stimulated (NS) or stimulated for 3 min with M-CSF (100 ng/ml; +). Samples were lysed and subjected to immunoprecipitation with anti-Erk2 Abs or isogenic control IgG. A, The immunoprecipitates were separated by SDS-PAGE and blotted with Abs against phospho-Erk1,2. B, Densitometry was assessed on phospho-Erk1,2 immunoblots and was expressed in relative DU. 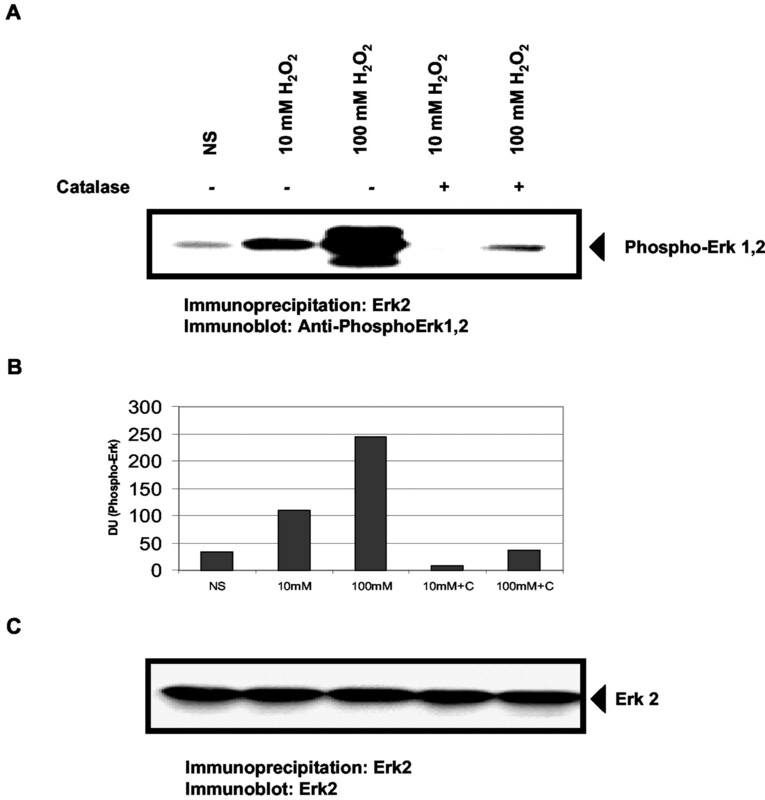 C, The anti-phospho-Erk immunoblots were stripped and immunoblotted with anti-Erk2 Abs to evaluate equal loading. These data are representative of three independent experiments each. We extended these observations to demonstrate that the PI 3-kinase inhibitors LY294002 or wortmannin suppressed Erk activation in M-CSF-stimulated monocytes in a dose-dependent manner (Fig. 2⇓A). The membranes were stripped and reprobed with anti-Erk Abs (Fig. 2⇓B). The ratio of phospho-Erk to total Erk staining was demonstrated by densitometry (Fig. 2⇓C). A–C, Wortmannin and LY294002 suppress Erk phosphorylation in a dose-dependent manner. Human monocytes (10 × 106/condition) were serum starved, preincubated with wortmannin (10–100 nM), LY294002 (1–100 μM), or the solvent control DMSO for 30 min and treated for 3 min with or without M-CSF (100 ng/ml; +). Samples were lysed and subjected to immunoprecipitation with anti-Erk2 Abs or isogenic control IgG. Anti-Erk immunoprecipitates were resolved by 10% SDS-PAGE, transferred to nitrocellulose, and blotted with Abs to active phosphoserine-Erk1,2 (A). The blots were stripped and reblotted with anti-Erk2 to demonstrate equal loading of the samples (B). To quantify these data, we performed densitometry on both blots and expressed the data as a ratio of DU of phospho-Erk blots to anti-Erk2 blots (C). This experiment is representative of three independent studies. D–F, Inhibitors of p38 MAP kinase do not suppress Erk phosphorylation after stimulation with M-CSF. Human monocytes (10 × 106/condition) were serum starved, preincubated with the solvent control DMSO, the active p38 inhibitors SB202190 (1 μM) and SB203580 (1 μM), the negative control inhibitor SB202474 (1 μM), and LY294002 (100 μM), wortmannin (100 nM), or PD098059 (10 μM) for 60 min and treated for 3 min with or without M-CSF (100 ng/ml; +). Samples were lysed and subjected to immunoprecipitation with anti-Erk2 Abs or isogenic control IgG. Anti-Erk immunoprecipitates were resolved by 10% SDS-PAGE, transferred to nitrocellulose, and blotted with Abs to active phosphoserine-Erk1,2 (D). Densitometry was performed and expressed in DU of the ratio of phospho-Erk to total Erk (E). The blots were stripped and reblotted with anti-Erk2 to demonstrate equal loading of the samples (F). Because the PI 3-kinase inhibitor wortmannin has been shown to inhibit not only PI 3-kinase but also the p38 MAP kinase, we next evaluated whether wortmannin was actually working through p38 to regulate Erk activity. For these studies, we used the active p38 inhibitors SB202190 and SB203580 and found no suppression of Erk activation after M-CSF stimulation (Fig. 2⇑D and quantified by densitometry (Fig. 2⇑E)). The blot was stripped and reprobed for total Erk (Fig. 2⇑F). Thus, inhibition of PI 3-kinase activity appeared to interfere with Erk activity in M-CSF-stimulated monocytes. Based on previous data (8), we speculated that 3-phosphorylated PI 3-kinase products might induce Erk activation in M-CSF-stimulated monocytes through the production of ROS. To determine whether these M-CSF-stimulated monocytes produced ROS, we used electron spin resonance (ESR) with DMPO as a spin trap and found that monocytes stimulated with M-CSF gave an EPR signal consistent with the production of ROS that peaked in 10–20 min (Fig. 3⇓A). Importantly, this EPR spectrum was inhibited by wortmannin, but not by DMSO or PD098059 (Fig. 3⇓B). M-CSF-stimulated monocytes produce reactive species. Using ESR with DMPO as a spin trap, monocytes (5 × 106/ml) were incubated with 100 mM DMPO and were stimulated with M-CSF (100 ng/ml) and assayed at 2, 5, 10, 20, and 30 min by ESR (A). Subsequently, monocytes (5 × 106/ml) were treated with wortmannin (50 nM), DMSO, or PD098059 (10 μM) for 30 min and then were left not stimulated (NS) or incubated with M-CSF for an additional 20 min in the presence of the spin trap DMPO, and ESR spectra were recorded (B). This experiment is representative of three independent studies. Monocytes (5 × 106/ml) were incubated with HFLUOR (5 and 10 μM) for 30 min at 37°C. Production of ROS was measured as changes in HFLUOR fluorescence for 5–10 min as a baseline reading and after stimulation with M-CSF (100 ng/ml) as indicated by the arrowhead. A representative sample of the results from a single experiment at each concentration of HFLUOR is shown (C). To confirm the production of ROS seen with ESR, we used the redox-sensitive fluorescent probe HFLUOR to measure changes in the production of ROS after stimulation with M-CSF. Consistent with results seen using ESR, M-CSF stimulation of human monocytes resulted in an increase in ROS production as measured by changes in fluorescence. (Fig. 3⇑C) The change in fluorescence afterM-CSF stimulation was significant (p = 0.03 for 5 μM and p = 0.02 for 10 μM HFLUOR) in comparison to baseline fluorescence. To determine whether ROS were independently capable of inducing Erk activation, we next stimulated human monocytes with increasing concentrations of H2O2 in the absence of M-CSF. We found that H2O2 stimulated Erk activation, which was suppressed by preincubating H2O2 with catalase (Fig. 4⇓A). Despite differences in staining for phospho-Erk in these samples, equal amounts of Erk were loaded in each lane tested (Fig. 4⇓C). Densitometry of phospho-Erk blots was quantified using densitometry (Fig. 4⇓B). Exogenous H2O2 induces Erk activation in human monocytes. Monocytes (10 × 106/condition) were either left not stimulated (NS) or stimulated with H2O2 (10 or 100 mM) for 15 min without or with catalase (1900 U/ml; +). A, The samples were lysed and whole cell lysates immunoprecipitated with an anti-Erk Ab, separated by SDS-PAGE gel, and immunoblotted using anti-phospho-Erk1,2 Abs. B, Densitometry was performed from blots in A and expressed as relative DU. C, The membrane was stripped and reprobed for Erk. This figure is representative of three independent studies. 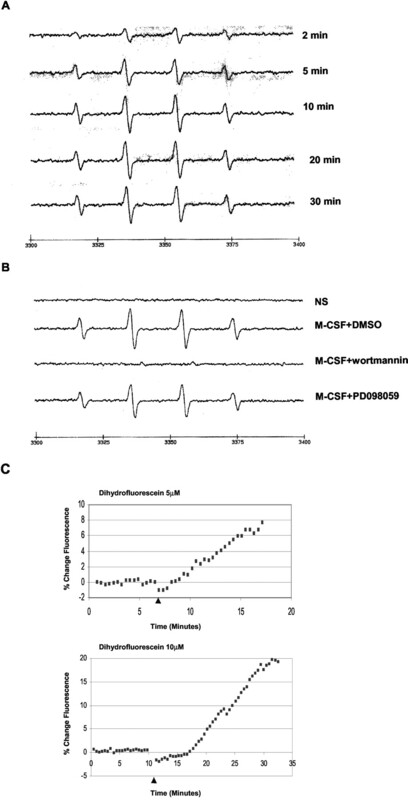 Because ROS appeared to be independently capable of inducing Erk activity and were produced in M-CSF-stimulated monocytes, we next wanted to determine whether ROS mediated Erk activity in M-CSF-stimulated monocytes. In addition to LY294002 and PD098059, we found that both NAC and DPI also suppressed Erk activation in M-CSF-stimulated human monocytes (Fig. 5⇓, A–C). However, preincubating catalase with H2O2 before stimulating monocytes decreased Erk activation. Conversely, when catalase was preincubated with the cells before the addition of H2O2, there was little impact on Erk activation (Fig. 5⇓, D–F). These data suggested that catalase was unable to enter the cell to inhibit ROS production. NAC and DPI suppress M-CSF-induced Erk activation in human monocytes. Monocytes (10 × 106/condition) were left not stimulated (NS) or incubated with M-CSF (100 ng/ml) for 3 min (+). A, The cells were lysed, separated by SDS-PAGE gel, and Western blotted using anti-phospho-Erk1,2. B, Densitometry was performed from blots in A and expressed as relative DU. C, The membrane was stripped and reprobed for Erk. This figure is representative of three independent studies. Monocytes were serum starved, preincubated with a solvent control or catalase (1900 U/ml) for 120 min as indicated. The cells were then left not stimulated (NS) or incubated with M-CSF (100 ng/ml) for 3 min. D, The cells were then lysed, separated by SDS-PAGE gel, and Western blotted using anti-phospho-Erk1,2 Abs. E, Densitometry results are shown. F, The membrane was stripped and reprobed for Erk. Because monocyte survival promoted by M-CSF is dependent on PI 3-kinase activity and PI 3-kinase activity appeared to help regulate Erk activity, we next hypothesized that Erk may be involved in monocyte survival. To test this hypothesis, we found that the Erk inhibitor PD098059 promoted cytosolic DNA fragmentation in human monocytes treated with M-CSF (Fig. 6⇓). In contrast, the solvent control for PD098059, DMSO, did not similarly induce DNA fragmentation in M-CSF-treated monocytes. Cytosolic DNA fragmentation in M-CSF-stimulated human monocytes is enhanced by inhibitors of Erk. Human monocytes (5 × 106/condition) were preincubated with PD098059 (1–100 μM) or the solvent control DMSO for 1 h. The cells were then left not stimulated or treated for 2 min with M-CSF (100 ng/ml). Cytosolic DNA fragmentation assays were performed. These data represent three independent studies. The focus of this study was to define the biochemical pathways stimulated by M-CSF to activate Erk in human blood monocytes. To promote Erk activation after M-CSF stimulation, convention suggests that the binding of adapter molecules like Shc and Grb2 to phosphorylated tyrosine residues in the M-CSFR leads to the activation of Ras. Ras activates Raf1, which in turn stimulates MEK/MAP kinase kinase, leading to Erk activation. However, in addition to inducing the activation of Raf1, Ras can also activate PI 3-kinase. Thus, we speculated that M-CSF might activate Erk, in part, through PI 3-kinase activation. Consistent with our hypothesis, the PI 3-kinase inhibitors LY294002 and wortmannin suppressed M-CSF-induced Erk activation in human monocytes. These data suggested that 3-phosphorylated PI intermediates play an important role in Erk activation. We next wanted to determine how PI 3-kinase products led to Erk activation. Using ESR with DMPO as a spin trap, we found that M-CSF stimulated blood monocytes to produce ROS. These ESR spectra were suppressed by PI 3-kinase inhibitors but not by DMSO or MEK inhibitors, suggesting the PI 3-phosphorylated products of PI 3-kinase appeared to help regulate ROS production in monocytes incubated with M-CSF. PI 3-kinase inhibitors also reduced Erk activation in M-CSF-stimulated human monocytes, suggesting the possibility that ROS played a role in Erk activation. To further test this hypothesis, we found that, in the absence of M-CSF, H2O2 induced Erk activation, which was inhibited by catalase. These data suggested that ROS were capable of inducing Erk activation and that PI 3-kinase products may stimulate Erk through ROS. To determine whether ROS modulated Erk activation in M-CSF-stimulated monocytes, we found that DPI and NAC both inhibited Erk activation in M-CSF-stimulated monocytes. To ensure that M-CSF was not working through p38 to induce Erk activity, we found that the p38 inhibitors SB202190 and SB203580 had no effect on M-CSF-induced Erk activity. We speculate that the regulation of Erk activity by ROS may have important immunological ramifications. Erk activation is important in the growth, differentiation, and development of hematopoietic cells and has been found to augment cellular survival (19, 20, 21). In human monocytes, we determined that PI 3-kinase products and Akt appeared to regulate M-CSF-induced cellular survival. After finding that PI 3-kinase products also played an important role in Erk activity in M-CSF-treated human monocytes, we wondered whether Erk also played a role in cellular survival to M-CSF. Using PD098059, which inhibits Erk activity in M-CSF-treated monocytes, we found that cytosolic DNA fragmentation was augmented, suggesting that Erk activity played a role in monocyte survival. These data suggest the possibility that Erk and Akt work together in facilitating monocyte survival. Although this is speculative, Akt and Erk both stimulate NF-κB activation, which has been found to participate in cellular survival in hematopoietic cells. Interestingly, antioxidant strategies are used in humans as a treatment for inflammatory diseases characterized by targeted accumulation of macrophages at a tissue site. A unifying hypothesis for the action of these agents may be to reduce macrophage accumulation through effects on signaling pathways activated by ROS, including the activation of Erk. Although our data suggest that PI 3-kinase and ROS regulate Erk activity, we do not clarify which signaling proteins were activated by PI 3-kinase products and ROS to activate Erk. In other cellular models, H2O2 induced signals upstream of Ras to activate Erk (22). Other studies have also suggested that decreased phosphatase activity can contribute to Erk activation in response to H2O2 stimulation (23). In our model, the MEK inhibitor PD098059 suppressed Erk activation in M-CSF-stimulated monocytes, leading us to speculate that signaling molecules activated by PI 3-kinase products and ROS interact with the MAP kinase pathway proximal to MEK. Studies are ongoing in our laboratory to determine specific oxidant targets in human monocytes and currently focus on the activity state of Raf. Our data also suggests an important role for Erk in M-CSF-induced cellular survival, because interrupting MEK activity increased DNA fragmentation in monocytes stimulated with M-CSF. These data add to our previous observations that PI 3-kinase products augment monocyte survival by inducing the kinase activity of the serine threonine kinase Akt. We now speculate that Akt and Erk work in concert to augment monocyte survival, providing an additional biological target that may influence the survival of blood monocytes in disease states. In summary, we report that M-CSF stimulates the activation of Erk in human monocytes, at least in part, through a PI 3-kinase- and ROS-dependent pathway. We found that PI 3-kinase inhibitors suppressed ROS produced in M-CSF-stimulated human monocytes. In the absence of M-CSF, H2O2 induced Erk activation in human monocytes, suggesting that ROS were capable of inducing Erk activation. Consistent with a role for ROS in stimulating Erk activity in M-CSF treated monocytes, DPI and NAC suppressed Erk activation. Activation of Erk by M-CSF appears to contribute to cellular survival in human monocytes. We speculate that this activation pathway may play an important role in modulating inflammation in human disease and may serve as an important target to reduce inflammation and organ injury in these processes. ↵1 This study was supported by National Institutes of Health Grants 3MO1RR00034, RO1HL62054, RO1HL66108; the Johnie Walker Murphy Career Investigator Award in Interstitial Lung Disease; the Kelly Clark Foundation; and the American Lung Association (to C.B.M.). ↵2 N.Y.B. and T.W.K. contributed equally to this work. ↵4 Abbreviations used in this paper: PI, phosphatidylinositol; MAP, mitogen-activated protein; Erk, extracellular-regulated kinase; MEK, MAP/Erk kinase; ROS, reactive oxygen species; NAC, N-acetylcysteine; DPI, diphenyleneiodonium; ESR, electron spin resonance; HFLUOR, dihydrofluorescein; DU, densitrometic unit; EPR, electron paramagnetic resonance; DMPO, 5,5-dimethyl-1-pyrroline-N-oxide.